How Do Learning Disabilities Increase Addiction Rates? Current statistics show that one in five U.S. children has a learning disability. Unfortunately for children with learning disabilities, adults are often unaware of the extent of the problem, and erroneously believe that the symptoms of learning disabilities are part of growing up. If not addressed early in life, learning disabilities can lead to severe impairment in a person’s day-to-day functioning, and increase their chances of becoming addicted to drugs and alcohol. Stigma and lack of awareness on the part of educators and adults increase the chances that a child with a learning disability with repeat grades, will get suspended, or drop out of school. All of these consequences greatly increase the chances that a vulnerable individual will turn to drugs or alcohol to cope. 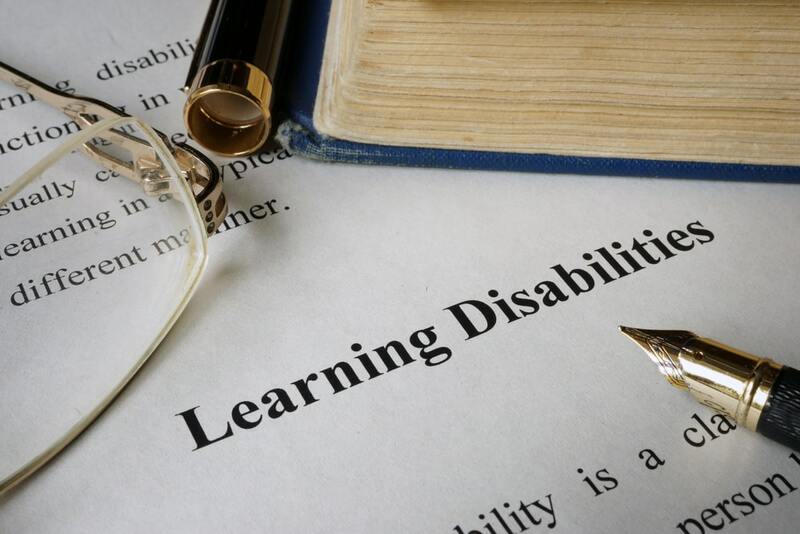 The following article will explore how untreated learning disabilities contribute to addiction rates, and where people can turn to for help in addressing these issues. Dyslexia is the most common learning disability in the U.S. Dyslexia impairs a person’s ability to read, and therefore, comprehend text. People with dyslexia may also experience problems between words and letters that sound similar. The second most common learning disability is ADHD. About 6.4 million people in the U.S. have an ADHD diagnosis. People with ADHD have a difficult time staying focused and completing tasks. Dyscalculia is another common learning disability where people have difficulty understanding math. People with dyscalculia may have trouble with concepts like time, measurement, and estimation. They may also order numbers incorrectly and struggle with completing a basic math problem. Dysgraphia, or difficulty writing, is another common learning disability in the U.S. Individuals with dysgraphia may struggle with holding a pen or a pencil and organizing their thoughts coherently through writing. People with dysgraphia will also have trouble understanding grammar and structuring sentences. Learning disabilities also encompass an array of processing deficits. People with a processing deficit have trouble understanding and processing sensory data. Processing deficits can include things that are auditory, or visual, making it hard for people to remember relevant information. How do these disabilities negatively impact people? Unfortunately, people with learning disabilities are often stigmatized and needlessly suffer as children, which negatively impacts them as adults. 48% of parents of children with learning disabilities believe that their children will simply outgrow these deficits, while 33% of educators think children who display symptoms of a learning disability are lazy. Students who do not get early invention for their learning disability are at increased risk of being suspended, held back a grade, or dropping out of high school. Lower levels of educational attainment are highly correlated with negative life outcomes, including poorer health and also increased rates of addiction and drug abuse. Why do people with learning disabilities have a higher incidence of addiction problems? The risk factors for teenage substance abuse are similar to the behavioral effects of learning disabilities. Current research on the links between learning disabilities and substance abuse find that learning disabilities can lead to substance abuse by increasing the risk factors and behaviors associated with drug or alcohol addiction. One of the keys to preventing this from happening to children with a learning disability is through early intervention services. However, treatment needs to be tailored for both issues if it is to be the most effective. Also, research has indicated that children who are exposed to drugs, tobacco, or alcohol in utero are at increased risk for learning disabilities, developmental delays, and disorders, as well as drug and alcohol addiction later in life. It’s important for educators, parents, and health care officials to be aware of the complex constellation of issues related to addiction and learning disabilities that affect children’s well-being as they enter adulthood. Which learning disabilities are the most highly correlated with increased addiction rates? Unfortunately for people with dyslexia, the disorder is usually associated with a diagnosis of ADHD as well. Up to 40% of people with a dyslexia diagnosis also suffer from ADHD. Individuals with both diagnoses are at a higher risk of addiction and also legal issues if their disabilities are not addressed with the correct interventions and treatment. Also, people in rehab for addiction have higher rates of learning disabilities, such as dyslexia, than the general population. How can you help a loved one with comorbid learning disabilities and addiction? It’s critical that people with learning disabilities receive treatment that is tailored to their specific needs. In most cases, long-term inpatient rehabilitation is the most effective way to address a learning disability and addiction. At an inpatient rehab center, doctors, mental health counselors, and social workers are all available 24/7 to help patients with their specific needs. In addition, spending several months in a rehabilitation facility gives both patients and their healthcare team time to address the patient’s issues and create customized treatment plans for them. For family and friends of the disabled, it’s important to help their loved one find a rehabilitation center that is experienced with assisting patients with special needs. It may take several calls and emails to find a facility that is staffed with a team of professionals who are knowledgeable about the complex relationship between learning disabilities and addiction. There is no cure for addiction, but symptoms can be effectively managed. It’s crucial that people with learning disabilities are given the tools they need to recognize their unique triggers and cope with stressors that may increase their chances of abusing drugs and alcohol. Inpatient rehab facilities give patients a chance to explore the ways in which the unique stressors they face as a person with a learning disability influenced their addictive behaviors. With customized treatment and maintenance plans established, patients with a learning disability can go on to live a life free from drug addiction and abuse. If you or someone you love has a learning disability and is struggling with addiction, please reach out a drug abuse counselor today and explore your treatment options for drug addiction.